Daniel Lee Miller was born in Bakersfield, CA., on June 9, 1987, and passed away in Bakersfield, CA., on January 10, 2019. He was the first-born child of Max and Colleen Miller and older brother to John and Tara. Daniel attended Discovery Elementary School from kindergarten through sixth grade. He then attended North Kern Christian School Independent Study Program. He graduated from Bakersfield Christian High School, class of 2005, and earned his bachelor's degree in history with a minor in criminal justice from CSUB. He most recently completed 10 weeks of gas service school through PG&E, where he has been employed for the past two years. 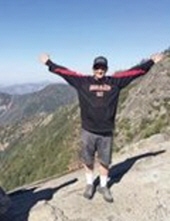 Prior to his new career with PG&E, Daniel had been a full-time substitute teacher for approximately four years in addition to assisting the varsity coach at McFarland High School with the cross country team. Before he joined the MHS cross country family, he wrangled horses in Santa Barbara and was a wrangler/cowboy for Rankin Ranch; all of these were jobs he loved with great passion. During college, Daniel attended and graduated from Officers Candidate School for the USMC in Quantico, Virginia. Daniel was a kind-hearted young man, who was diverse in his interests and hobbies. He enjoyed everyone he knew and tried to see the good in people and situations. He is survived by his parents, siblings, numerous aunts, uncles, cousins, friends, colleagues, and his niece, Cora, and nephew Warren. There is so much more to share of Daniel's life. Service will be held Saturday, January 19 at 10:00 a.m. at Christ's Church of the Valley, 13701 Stockdale Hwy, Bakersfield. Graveside service to follow at Shafter Memorial Park. Peter's Funeral Home, Shafter is handling arrangements. To send flowers or a remembrance gift to the family of Daniel Lee Miller, please visit our Tribute Store. "Email Address" would like to share the life celebration of Daniel Lee Miller. Click on the "link" to go to share a favorite memory or leave a condolence message for the family.